Being a job shop, we supply a product based on a customer supplied print specifically for that customer. All specifications and tolerances of the print are adhered to throughout the entire phase of a job to insure a quality product when completed. 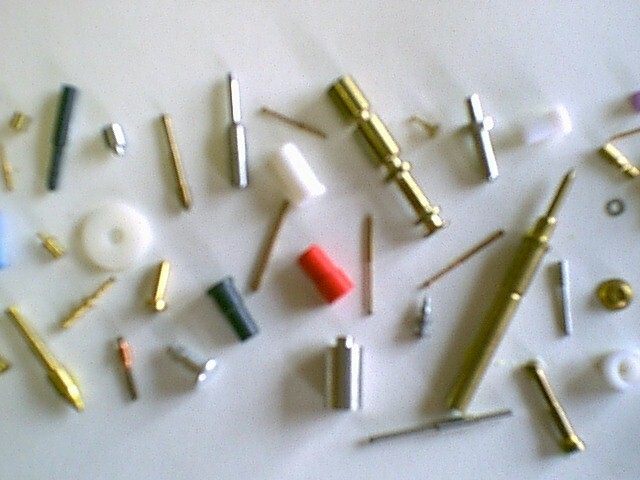 Above is a small sample of components we have made. Upon receipt of a purchase order our manufacturing process begins. The material for the job is inspected prior to being put on the floor for use. The print is put with the machine that will be manufacturing the component. The machine is set up for the particular job and a sample of components are produced for inspection. Once the sample meets all of the criteria of the print, the job is set in motion. Spot inspections are made throughout the entire phase of the job. At the end of each day the parts are collected from the machine to be cleaned and further inspected. Once the job is completed, a final inspection is made of the components. Upon final approval, the components are ready for shipment to the customer.